Update (1/Dec/2014) : RunKeeper now syncs with HealthKit, on iOS you can find it in the app under Settings -> Apps, Services, and Devices -> Apple Health. RunKeeper can read/write calories, cycling, walking+running distance (not steps), weight, etc. Step 1) Sync with Strava: You can easily have an automated sync with Strava using tapiriik (https://tapiriik.com). Tapiriik is one of those services that I love because they just work, all the time. Sometimes I’ve found myself forgetting it’s name when I wanted to suggest it to someone :) The best part of it is that the first time you sync, it will actually transfer your entire history of RunKeeper into Strava! Step 2) Strava integrates with HealthKit already. The process is relatively easy, and can be found under Settings -> Link Other Services. 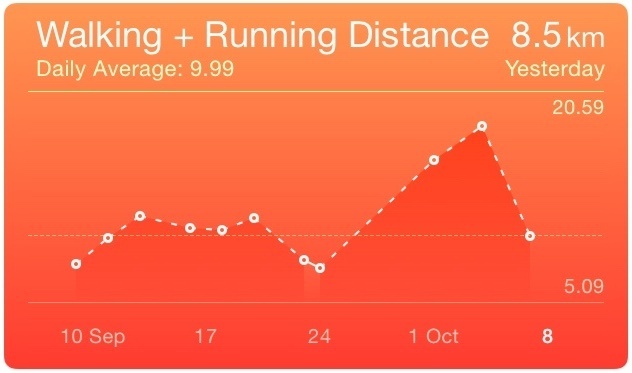 After enabling this, you can add Strava as a source under “Walking + Running Distance”. Strava is kind enough to actually import data from the last 30 days (as opposed for example to MyFitnessPal which starts syncing from the first day that you add the link). In general, the syncing isn’t always trouble-free, a couple days Strava would add double entries into Health, and Health would show that I did double the distance of the actual number (which is why you see 20km in a single day on the screenshot above :)). This entry was posted on Friday, October 10th, 2014 at 4:07 pm	and is filed under Productivity, Technology.